MAGGI® and MOE search for talented young chefs! KUCHING: The annual MAGGI® Secondary Schools Cooking Competition (MSSCC) returns for the 23rd consecutive year! A joint initiative by MAGGI® and the Education Ministry (MOE), this year’s MSSCC raises the bar by incorporating new challenges aimed at inspiring students to embrace Higher Order Thinking Skills (HOTS). MOE sports and arts education division deputy director Suhaimi Sun Abdullah officiated at the launch of this year’s MSSCC event at Sekolah Menengah Kebangsaan Agama Precinct 11 in Putrajaya. MAGGI® corporate executive chef Abdul Muluk (from left), SMKA Putrajaya Precinct 11 principal Othman Hashim, Suhaimi, MAGGI® shopper and consumer engagement Lester Khan, MAGGI® marketing manager Kimberly Oh and Putrajaya Federal Territory deputy director of the Education Department Amat Roslan posing with the students taking part in the competition. The theme for MSSCC 2019, “You and MAGGI® making a positive impact through homemade meals”, focuses on offering young chefs a fun and competitive platform to showcase their skills in creating wholesome home-cooked meals. It is also aimed at cultivating a love of cooking among Malaysian students. Building on key learnings from the previous year’s editions, MSSCC 2019 will see an enhanced structure as well as new components to elevate the competition. 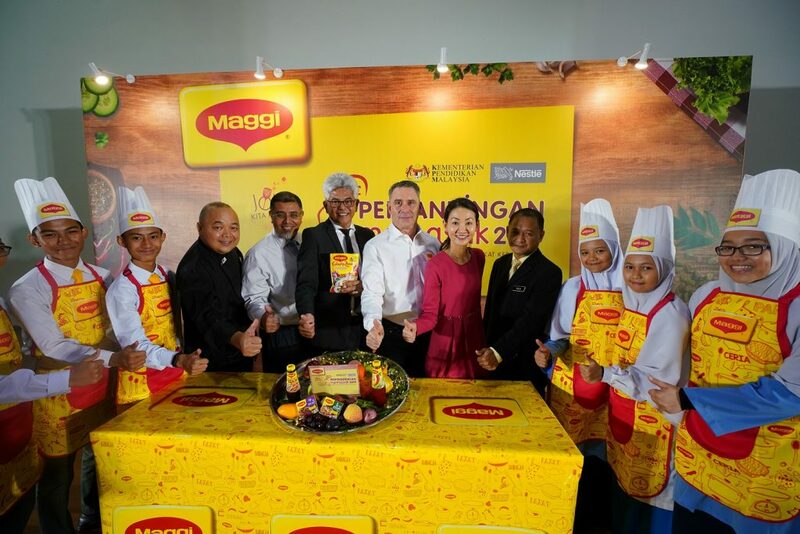 MAGGI® marketing manager Kimberly Oh said, “We are thrilled to once again give young Malaysians the opportunity to demonstrate their culinary prowess through MSSCC! “Unlike in previous years where students would create dishes based on pre-determined recipes, this year’s competition starts off with the Creative Cooking Challenge, requiring students to tap into their creativity and problem-solving skills right from the onset. “There is also a greater emphasis this year on presentation and communication skills as the students must present their recipes and dishes they create,” she added. “In tandem with this, we continuously strive to impart the importance of leading a healthy lifestyle through good nutrition. This ties back to our brand purpose of creating good food moments for individuals and families,” she added. Suhaimi said, “We welcome collaborative efforts, especially with the private sector, to work hand in hand in nurturing a healthier generation of Malaysians and are pleased to continue this long-standing partnership with MAGGI® to inculcate good eating habits amongst students. “We are confident that the new and exciting elements will further inspire the students to embrace Higher Order Thinking Skills and provide a strong platform to enable them to grow their capabilities,” he added. For the Creative Cooking Challenge which takes place during both the state and national levels, participants are given a collection of ingredients, thus challenging these young chef’s creativity in crafting their dishes. Creativity then takes hold as the young chefs must determine what dishes to create using these ingredients. This year’s competition also utilises a fresh approach in judging and scoring, whereby students will be assessed based on culinary skills alongside key technical skills such as table setting and plating, show and tell presentation, cooking methods as well as nutritional benefits. In addition, students have the opportunity to learn to express themselves by explaining their ideas and inspiration behind their dishes to the judging panel and audience, igniting a passion for cooking through a fun and interactive learning environment. MAGGI® launched the MSSCC programme in 1997 in line with the aim of nurturing an interest in cooking amongst young Malaysians and promoting good nutrition and cooking habits. To date, over 10,000 schools and nearly 340,000 students have participated in this programme and gained vital knowledge and skills on food, nutrition and healthy eating. MAGGI® and MOE search for talented young chefs! 0 out of 5 based on 0 ratings. 0 user reviews.